Shortbread cookies with rainbow colors – amazing, huh. 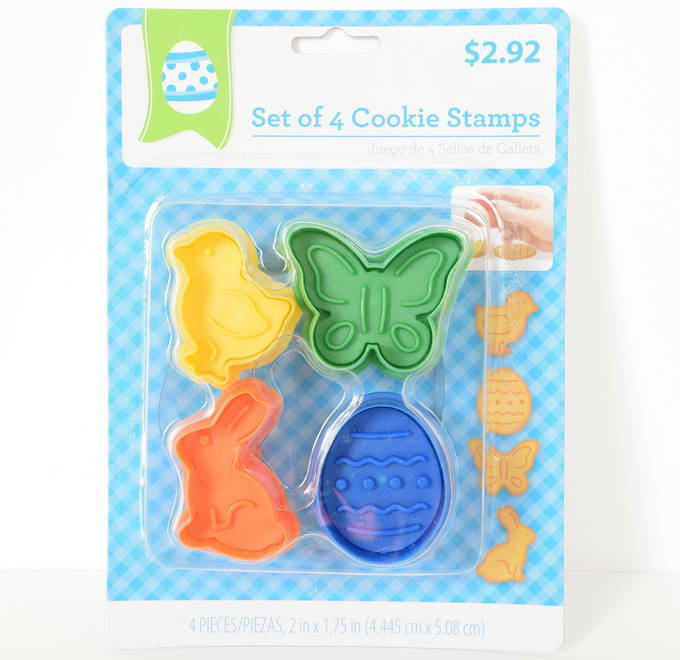 And I love these cookie stamps – the shapes are so cute. My incredible shortbread cookies are traditionally dough colored. It was fun to change things up to make them rainbow colored. I usually bake the cookies in a pan and cut them into squares. But I worked with the recipe to add color and make them cut outs. What a happy day – when my final batch turned out perfectly. I was looking at Easter decor and boom this set of cookie stamps jumped out at me. It is great to find a seasonal baking item that you like. 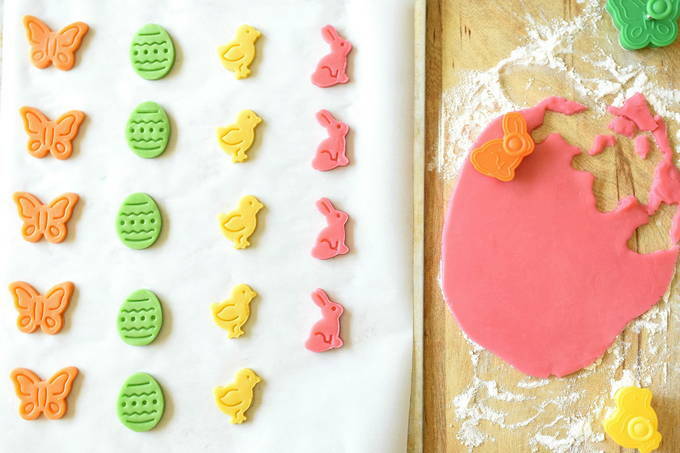 Now, if you miss out on these cookie stamps, it’s ok, because you can use any small cookie cutter. The stamps in this set are 1¾ x 2”. How do they taste? Amazing. They’re of course very buttery but also light and sweet. It is very hard to stop eating them. Plus, with their small size you want to eat several. Shortbread cookies are nice to make, because everything you need is usually in your pantry. To color the cookies, I used Americolor ™ food coloring. Here are the details on how to make them. In a large bowl, combine flour, salt, and baking powder. Set aside. 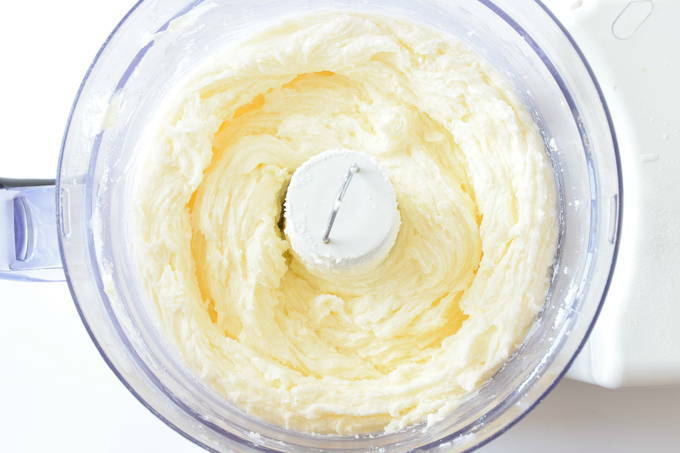 Mix butter, sugar, and vanilla in a food processor. It’s very thick so every once in a while you may need to remove the lid and break up the butter to get it moving along. Once it has fully blended and is smooth then gradually add the flour mixture. Process until combined or it’s not moving around well. 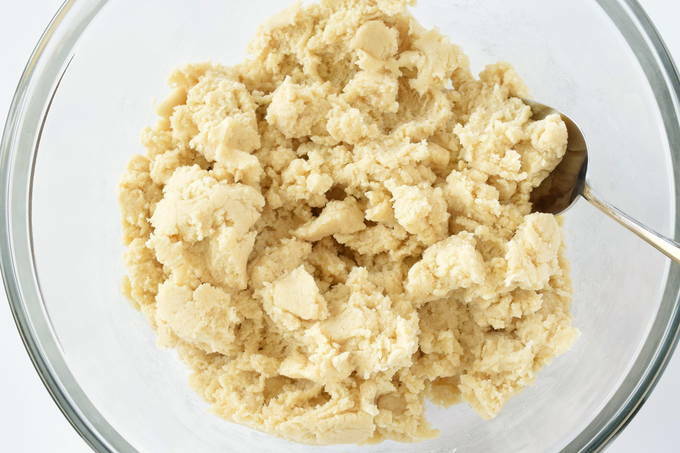 Remove dough from processor to a large bowl and mix with a large spoon until all the butter is stirred in. Divide it by putting about ¾-1 c. of the dough into six smaller bowls. Add 2 drops of the food coloring to each, except add 3 for the blue and purple bowls. (The dough gets darker as it bakes so don’t overdo the drops.) Mix with a small metal spoon until the color is worked through. Roll into a ball and then flatten a little. Put inside a plastic zip bag and refrigerate about 30 minutes. Take the dough out to soften and rework it into a ball. 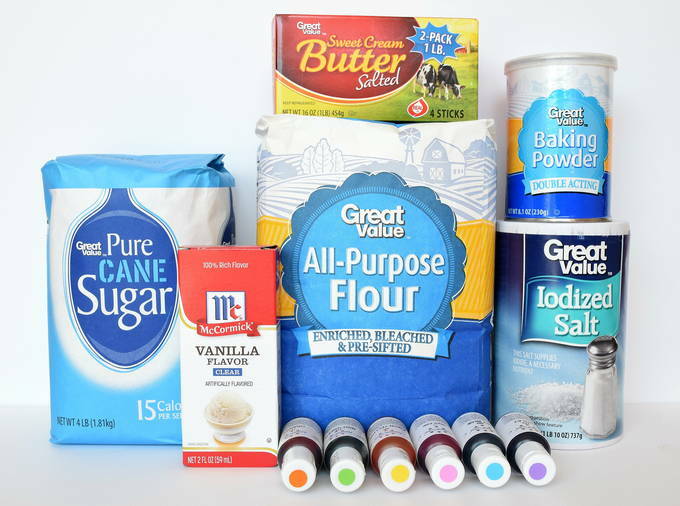 Roll each dough out individually on a well-floured surface to ¼” thickness. Lightly flour the top of the dough to keep it from sticking to the rolling pin. Lift it up in the cutter to put it on a baking sheet. Check for excess flour on the bottom and brush that off or tap the side of the cutter on your counter. On the baking sheet, press down the plunger to emboss it. Lift the cutter up and press the plunger again to release the dough from the cutter. Place them 2” apart on the baking sheet. Brush any flour off the back of the remaining dough and then reroll and cut it. Repeat with the other colors. 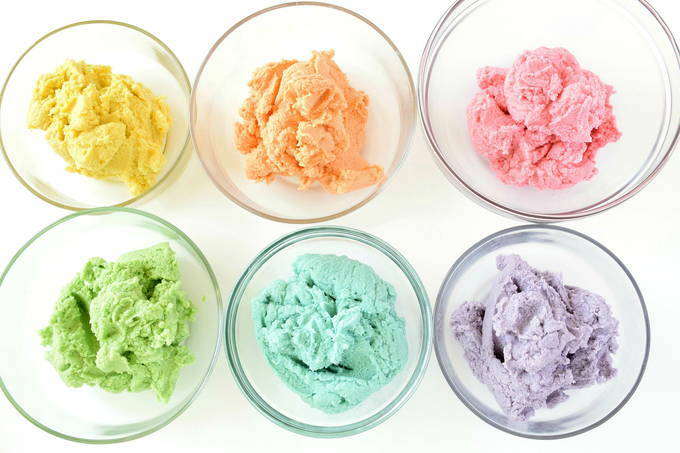 If a dough gets too soft to work with put it back in the fridge to chill while you work with another color. The cutter can be floured also. Clean your tools between colors. Bake 8 minutes. Let cool. Makes about 4 dozen. These shortbread cookies would be a hit at your picnic/egg hunt. And when you bring them, I’m pretty sure you’ll be taking home an empty plate.